When most people think of policies designed to help the poor, welfare is the first program that comes to mind. Traditionally welfare has served individuals who do not work --hence much of the stigma that some attach to the program. An equally important strand of American social policy, however, is meant to support low-wage workers and their families. In "Boosting Paychecks," Daniel Gitterman illuminates this often neglected part of the American safety net. Gitterman focuses on two sets of policy instruments that have been used to aid the working poor since the early twentieth century: the federal tax code and the minimum wage. The income tax code can be fine-tuned in many ways --through exemptions, deductions, credits, changing tax brackets and rates --to alter the amount of income workers are left with at the end of the day. In addition, it interacts with the minimum wage to determine the economic well-being of many lowincome households. 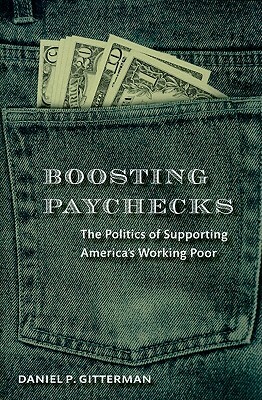 "Boosting Paychecks "analyzes the partisan politics that have shaped these policies since the New Deal era, with particular attention paid to the past three decades. It also examines the degree to which they have succeeded in lifting low-wage workers and their families out of poverty. Forging a new political bargain that balances labor market flexibility with security for poor working families is one of the most critical challenges facing government today. "Boosting Paychecks" sheds new light on the scope of this challenge and the political constraints and opportunities policymakers face. Author Name: Gitterman, Daniel P.